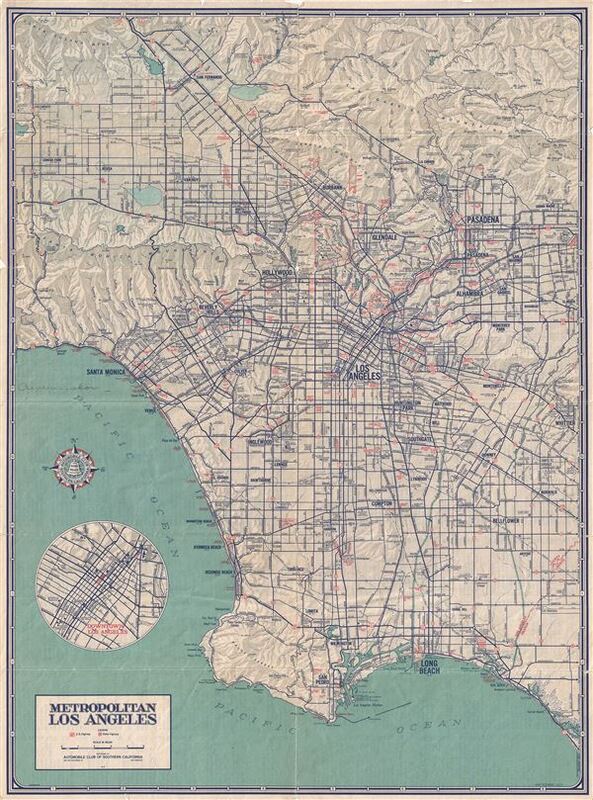 This is a fine c.1945 map of the city of Los Angeles, California issued by the Automobile Club of Southern California. It covers Metropolitan Los Angeles from San Fernando south to the Pacific Ocean and from Canoga Park east to El Monte. The map details various routes in and out of Los Angeles and notes lakes, streets, state and U.S. highways, harbors, parks, railroads, piers and a host of additional geographical and topographical details. An inset in the lower right quadrant details Downtown Los Angeles. Verso includes and index and mileage table. The map was copyrighted and issued by the Automobile Club of Southern California, 2601 So. Figueroa Street, Los Angeles as map number 1234. Very good. Minor wear along original fold lines. Minor spotting. Professionally flattened and backed with archival tissue.